Imagine going for a haircut. Only instead of showing you to a seat and wrapping you in a protective gown, the barber upends you roughly onto the floor and holds you immobile while he hacks at your head with a pair of hot, noisy mechanical shears. Imagine further that he provides no particular guarantee that one or more chunks of skin will not be chopped with the hair. If this happens, no pain relief will be provided. Once denuded, you are tossed into a chute to join fellow sufferers and cope with your pain, fear and bewilderment as best you can. This is what millions of sheep must endure two or three times every year. The average meat eater consumes 21 sheep over a lifetime, not including 4-5 lambs who die before reaching slaughter age. Each one of these was a gentle, friendly individual with his or her own unique personality, just the same as your pet dog or cat. Something, perhaps, to contemplate over the Sunday roast. In any given year, 99-120 million sheep are kept for their meat and wool in Australia alone, and 10-15 million will face the slaughtererâ€™s knife. Also killed will be around 12 million babies known as â€œprime lamb.â€� At 4-6 months old when they should be frolicking in the field under their mothersâ€™ watchful gaze, they will be driven into killing stalls, surrounded by the stink of blood and the cries of their frightened companions, to be electrocuted and have their throats cut. As with all methods of stunning, the effectiveness of electrocution varies according to the workerâ€™s skill and the pressure he is under, the upkeep of equipment, individual animalsâ€™ metabolisms, and many other factors. Sheep may regain consciousness before their throats are cut or while their blood is pouring out. A UK Study found that most slaughterhouse workers did not know what voltage or current should be used for effective stunning, or for how long it should be applied. It is a comforting fantasy that the animals we slaughter are somehow oblivious to their impending fates. An eyewitness account of sheep awaiting slaughter suggests otherwise. â€œThey were shaking, tremblingâ€¦they could smell the blood, their eyes were absolutely wild. As they went in (to the killing box) some of them made sounds like crying babies. Of course they knew what was happening.â€� A neuroscientist states that â€œThere is overwhelming evidence other mammals have many of the same basic emotional circuits that we doâ€�. Their lives, welfare and relationships are important to them, just as ours are to us. Sheep have facial expressions which we find hard to read, and their evolutionary history as a prey animal has made them perpetually wary. As a result, they have an undeserved reputation as foolish and flighty animals. People who have lived closely with sheep however, attest that they are affectionate and loyal companions who respond readily to training and are able to form close bonds with humans as well as other flock members. Recent studies have found that sheep can recognise and respond to familiar faces, learn from experience and solve problems. Sheep have generally been less affected by intensive farming practices than other farmed animals, however their living conditions are still far from ideal and can involve considerable suffering. They are kept in a wide variety of conditions ranging from hot dry and drought stricken, to very cold and wet, both of which cause severe welfare problems. Around two-thirds of the national flock live on properties with over 2000 sheep, where individuals receive little, if any, personal and veterinary attention when needed. In truth, most domestic sheep are cumbersome animals whom selective breeding has left susceptible to a wide variety of diseases and parasites, and with a heavy coat they cannot shed naturally. Even with human care, around 8 million Australian sheep die in the paddock every year from a variety of causes including hypothermia, drought, poor nutrition, lambing difficulties, flystrike, lameness and viral illnesses. It is estimated that 20% of lambs will die within the first few weeks of life, mostly from disease, exposure or malnutrition. Many of these deaths are unfairly blamed on predators such as foxes and dingoes, when they could more properly be attributed to human neglect. In order to prevent these deaths, most farmers subject their unfortunate charges to multiple mutilations and assaults â€œfor their own goodâ€� over the course of their short lives. According to Australian Law Reform Chairman, M.D. Kirby, Australian sheep suffer over 50 million operations a year that would constitute cruelty if performed on dogs or cats. Millions of Australian sheep every year suffer an agonizingly painful operation known as mulesing, where the folds of skin beneath their tails are sliced away without anesthetic, leaving a bleeding wound the size of a dinner plate where a wool free scar will form. This is intended to reduce the incidence of flystrike, a grisly condition where blowflies lay their eggs in the damp wool and maggots eat the sheepâ€™s flesh. Even those sheep who escape mulesing will most likely have their tails docked without pain relief. Lambs will have their ears hole punched for identification purposes. Ewes may have their front teeth ground down to the pulp with a stone-cutting machine, to prevent broken teeth in later life. Male lambs will be castrated, most commonly through the use of a tight rubber ring to cut off blood supply to the testicles, one of the most painful methods possible. All will be immersed in baths of toxic pesticides at regular intervals, their heads held under with a broom or crook, and will receive numerous drugs and vaccinations which may play havoc with their immune systems. Under natural conditions, sheep will give birth to a single lamb every spring. But genetic selection and intensive feeding have resulted in a growing number of twin and triplet births, with a consequent increase in lamb mortality. Lambing times too are manipulated. The so called â€œextended seasonâ€�, rapidly gaining popularity in Australia, allows farmers to get winter lambs to the market ahead of their competition. Unfortunately it also means that wooly babies must face bitter winter weather within a few days of their births. As another consequence of selective breeding, some lambs grow too large to pass through the birth canal. Rather than pay a vet to perform a caesarean, farmers may carry out a grisly procedure known as embryotomy, where the conscious lambâ€™s front legs are cut off while it is still in the womb. Shearing is generally seen as an innocuous procedure, like getting a haircut, even as a kindness by humans who relieve the sheep of those hot, heavy fleeces. It may come as a surprise to learn that wild sheep shed their wool naturally, and that it is only through selective breeding that farmed sheep have become dependent on humans for such a basic aspect of their welfare. Instead of growing a thick coat for winter and shedding it in summer as they would do in nature, they are now subject to the vagaries of wool prices and the schedules of farmers, leaving them vulnerable to extreme weather conditions. An estimated one million sheep die in the 30 days after shearing. Following the deaths from hypothermia of 1200 sheep near Bairnsdale in April 2004, a livestock manager advised, with a noted lack of concern, that â€œit was not unusual for freshly shorn sheep to die in the cold weatherâ€�. Similarly, a British industry spokesman remarks enthusiastically that â€œwinter shearing is the future of sheep farming. You take their coats off, they have to eat more to keep warm. You end up with a better meat-to-bone-and-fat ratio." Imagine going for a haircut. Only instead of showing you to a seat and wrapping you in a protective gown, the barber upends you roughly onto the floor and holds you immobile while he hacks at your head with a pair of hot, noisy mechanical shears. Imagine further that he provides no particular guarantee that one or more chunks of skin will not be chopped with the hair. If this happens, no pain relief will be provided. Once denuded, you are tossed into a chute to join fellow sufferers and cope with your pain, fear and bewilderment as best you can. This is what millions of sheep must endure two or three times every year. Before and after, they may be held in close confinement for many hours without food or water. Shearers are usually paid by volume, encouraging fast work and little incentive to be gentle with struggling, panic-stricken animals. An eyewitness remarks that â€œthe shearing shed must be one of the worst places in the world for cruelty to animalsâ€�. Australia also does a lucrative trade in â€œslipeâ€� or â€œpulledâ€� wool â€“ that is, wool taken from the bodies of sheep and lambs after slaughter. All sheep, whether primarily intended for meat or wool, end up in the slaughterhouse. They may first be transported long distances, packed tightly into trucks without food or water and exposed to all weather conditions. Many will pass through saleyards where harsh treatment and hours in crowded pens are normal. 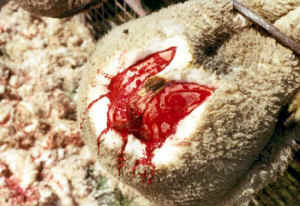 It is estimated that 25% of sheep receive severe bruising from rough handling prior to slaughter. Sheep endure harsh, pain-filled lives and miserable deaths, just so that humans can enjoy the taste of their dead bodies and adorn themselves in their hair, neither of which are in any way necessary for human health or wellbeing. Try getting to know one of those unfortunate animals whose lives we take so casually. You might just be surprised. Australia is the worldâ€™s largest exporter of live animals for slaughter in other countries. A total of 4,546,085 sheep, 763,215 cattle and 52,600 goats were exported live from Australia in 2003, to be killed in the Middle East, South East Asia, North Africa, China, Mexico and the Philippines, amongst others. Of these, over 45,000 sheep, around 840 cattle and some 420 goats died before reaching their destination. Those who survive the grueling sea voyage face slaughter without pre-stunning and often by crude methods which inflict prolonged pain and terror. Witnesses describe sheep flailing in agony for 30-40 seconds after having their throats slashed while fully conscious. For cattle it may be up to 90 seconds. The killing floor is slippery with blood, and terrified animals are forced to watch as their companions are slaughtered. Slaughterers frequently have little understanding of basic animal handling techniques and there are no restraining facilities to control panic stricken animals desperate to escape their fate. Victims are dragged to the slaughter area by a hind leg and forcibly wrestled to the ground, assisted by blows and kicks, and frequently breaking or dislocating bones in the process. At an Egyptian abattoir, slaughterers were observed fighting to control frightened cattle by slashing leg tendons, smashing knees with hammers, and stabbing eyes. Many live sheep are also bought for halal slaughter and consumption on the same day. Investigations of this â€œhome slaughterâ€� have revealed sheep being trussed with wire and forced into car boots in sweltering heat for the journey to the buyerâ€™s home. Upon arrival they are carried by their bound legs, which frequently break, and dropped on a concrete surface. Their throats are cut and they may writhe in their own blood for over a minute before losing consciousness. On board the multi-tiered ships, sheep are packed three per square metre. Decks may be open sided, exposing the animals to weather extremes, or enclosed so that they must rely on often inadequate artificial ventilation. Decks are almost never cleaned during the voyage of up to 24 days, and animals must stand in their own urine and faeces. On enclosed decks the dust and ammonia can build up to the extent that many sheep will be blind and suffering from severe respiratory infections upon unloading. And these are just the â€œnormalâ€� voyages. Countless disasters have occurred over the years where fire, disease outbreaks, ventilation failure, and rejection at the destination port have resulted in the deaths of innumerable animals and taken a massive toll in pain and distress. In a recent disaster, 57,937 sheep spent 11 weeks at sea following rejection by Saudi Arabia. 5692 died after enduring untold suffering. The real reasons behind the live export trade are profits, jobs-for-the-boys, and diplomatic relations between governments. It has little to do with religion, and still less to do with the interests of ordinary people or of animals. Australians need to question any rationale that subjects living, feeling beings to such enormous misery, and to decide whether we really want this happening in our names.